On December 6, several months after Toyota's DJ Robot ditched its entertainment career for a job as a receptionist and renamed itself "Robina," the auto giant unveiled a new, musically-inclined Partner Robot that can play violin. 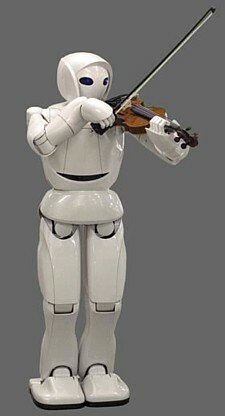 A total of 17 computer-controlled joints in its flexible arms and agile fingers allow the robot to hold the violin and correctly press the strings against the fingerboard with its left hand, while gently drawing the bow across the strings with its right hand. In a recital held at a Toyota showroom in Tokyo, the 152-centimeter (5-ft) tall humanoid entertained guests with a slightly robotic but technically adept rendition of "Pomp and Circumstance." The robot violinist is the latest addition to Toyota's ensemble of musical androids, which can also play trumpet, tuba, trombone, French horn and percussion. In addition to further developing its musical skills, Toyota aims to continue improving the robot's dexterity and coordination so that it can one day perform household chores. Also unveiled at the demonstration was a new mobility robot -- a motorized chair that balances itself on a pair of self-adjusting Segway-like wheels that can roll smoothly over uneven surfaces and rough terrain. Intended as a personal transport system for the elderly, the mobility robot can run at a maximum speed of 6 kilometers per hour (3.7 mph) for 20 kilometers (12 miles) on a single battery charge, can handle 10-degree slopes, and is outfitted with sensors that allow it to avoid collisions with obstacles. Users can also summon the robot by remote control and use it as a porter to carry luggage. Toyota plans to begin testing the robots at hospitals next year, with the hope of putting them into practical use by the early part of the next decade. Wonderful! The amount of precision and dexterity that it puts into playing the violin are amazing.